A refrigerant air dryer performs the essential function of removing water vapor and the contaminants it carries from compressed air. 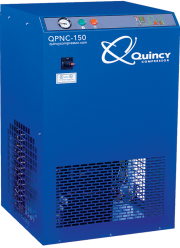 Quincy’s Refrigerated Air Dryers purify compressed air by chilling it to approximately 37°F. This causes entrained moisture to condense. Condensed moisture carries airborne dirt and oil to the separator where it is removed from the air stream by an automatic drain. We offer a wide selection of state-of-the-art air compressor dryer products including non-cycling, cycling and compact high-temperature dryers for numerous industrial applications. These units use a two-stage heat exchanger to maintain consistent dew points. Freeze-ups are prevented and optimum performance is maintained. The QPNC non-cycling compressed air dryers work by lowering the air temperature to 39°F, which causes the condensation of entrained moisture. The moisture is then directed to the specially designed moisture separator, where all liquids are removed. The cold, dry compressed air then returns through the first-stage heat exchanger for reheating by the incoming warm air. The QPNC is equipped with a non-cycling control panel, which provides easy and efficient operation. It also includes zero loss drains for maximum energy efficiency. The 10-year heat exchange warranty gives you comprehensive protection and peace of mind. 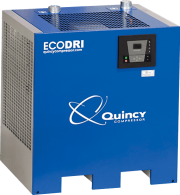 Quincy’s Eco Dri Cycling compressed air dryers are widely used in almost every industry where dry, contaminant-free compressed air is an absolute necessity. These units save energy by cycling the refrigeration on and off in response to demand. A three-stage heat exchanger system is employed to provide the cold storage necessary for the operation. In addition to improving the quality of the compressed air, our cycling dryers feature a compact design that offers maximum placement flexibility. They’re also simple to operate and extremely energy efficient, and they provide steady RH for excellent corrosion control. Unlike less technologically advanced models, Quincy cycling dryers do not require cooling of a glycol bath, and they’re designed to automatically adjust to account for changes in the operating environment. They come with a two-year full-coverage warranty, as well as an industry-best 10-year heat exchange warranty. The revolutionary QRHT air dryer for air compressor applications features five components, each of which performs a separate but vital function. Although they operate separately, the components’ functions blend together precisely to provide clean, dry compressed air. Designed for reciprocating compressors with high discharge temperatures, these dryers eliminate water, oil and dirt from air systems, preventing damage to pneumatic tools and cylinders. The result is fewer product defects and no “fisheye” paint splotches in applicable operations. The Quincy QRHT line includes five models that provide a maximum psig of 232. Depending on the model, the cfm@100 psig ranges from 25-125. 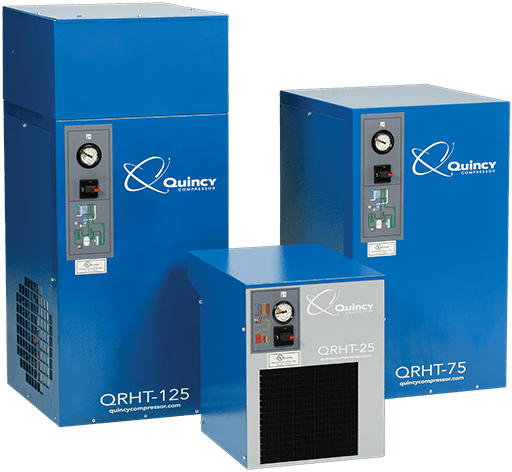 In addition to effectively eliminating moisture, oil and dirt from the air, a Quincy QRHT refrigerated compressed air dryer provides many hours of trouble-free operation and reduced operational downtime. It may also increase productivity and profitability throughout your operation. Quincy’s products are backed by nearly 100 years of air compressor industry experience. 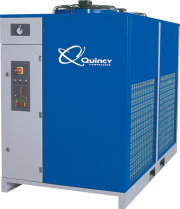 Your local authorized Quincy Compressor distributor will be happy to provide additional details about our complete line of refrigerated air dryer models. You can also contact us directly for more information.